R&D Air Supply Pty Ltd has completed the Mechanical Services installation at the new pharmaceutical manufacturing plant for Blackmores, located at 20 Jubilee Rd, Warriewood. The Blackmores site encompasses office space comprising North & South compounds with ground & first floors office space, administration, engineering & development, café & kitchen, and staff facilities. The Production facility consists of 8 production bays where bottling is carried out in an environmentally controlled space whilst maintaining pressure differentials between adjacent service rooms to comply with the Therapeutic Goods Administration (TGA) requirements. Storage of the finished products and packaging is within the adjacent air conditioned high level Warehouse. The Air Conditioning system comprises a central chilled and heating water system with associated Magnetic bearing water cooled chiller, cooling towers, chilled water pumps, and air handling plant located within two off, central plant rooms. Individual chilled and heating water fan coil units are located above ceilings within the office core areas. 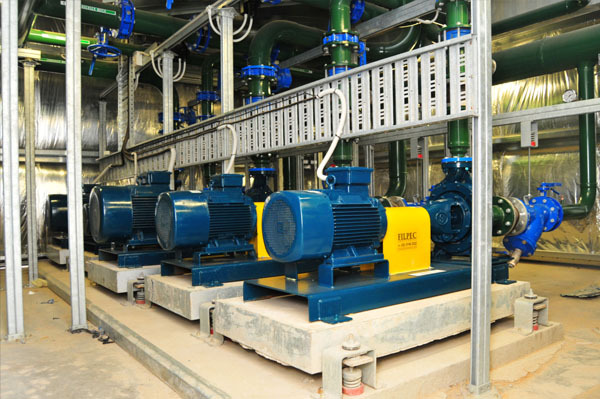 All air handling plant and water pumps have been provided with variable speed drives to maintain required pressure differentials and provide more energy efficient operation of the system. A Cogent energy plant comprising diesel generators, absorption chiller and waste heat exchangers has been installed by others. The air conditioning chilled and heating water is interconnected with the, by products, of the Cogent plant. The diesel generators provide dedicated power supply to the campus as an alternate energy source from the main electricity grid. The waste heat of this energy production is passed through an absorption chiller, which has been connected to the central chilled water system, providing sufficient chilled water for low load applications. 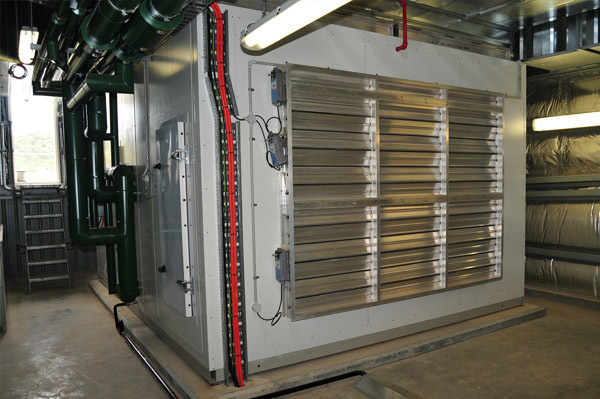 In times of greater need the Magnetic bearing chiller provides chilled water for the whole site. 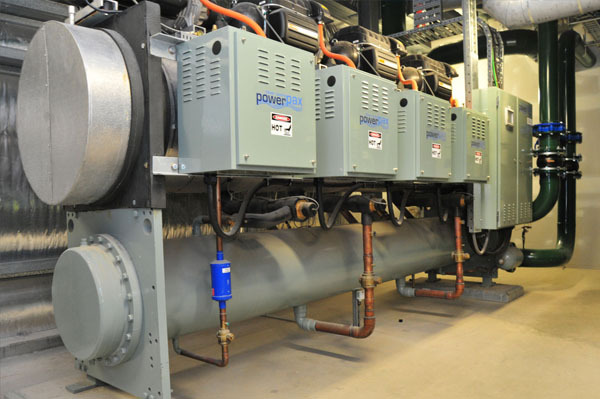 All heating is provided by the waste heat of the Cogent plant. The waste heat of the diesel generator is reticulated through heat exchangers which in turn heats the central heating water for the air conditioning system. This air conditioning system and Cogent plant is controlled by a Siemens BMCS system. This system has been rigorously tested and has been validated by the TGA as meeting their strict operational requirements. 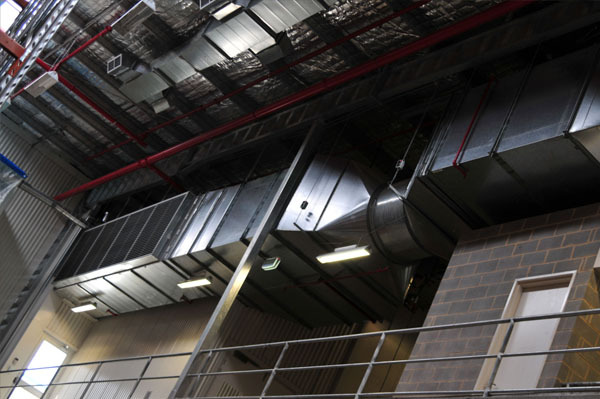 The resulting installation of the air conditioning system and interconnection with the Cogent plant has resulted in an extremely energy efficient production facility. The Blackmores Campus has a carbon footprint just one eighth of a comparable development as claimed by the Services Consultant. The project was extremely challenging. Considerable coordination and close working relationships were established and maintained with Bassett Consulting Engineers, the Services Consultant, St. Hillier's Pty Ltd, the Construction manager, and Blackmores, the client, to overcome buildability and operational issues to ensure TGA compliance and client satisfaction. The Blackmores Campus was officially opened on Saturday 2nd May 2009.